Automobile accidents are the leading cause of death for teenagers. Specifically, for young adults in the age group of 15 to 20, the chances of being killed in an automobile accident far exceed the odds of dying any other way. In addition to the tragedy of losing a young person with their whole lives ahead of them, impaired driving collisions often involve other vehicles and more innocent victims. According to www.madd.ca, the Canadian chapter of Mothers Against Drunk Driving, young adults have the highest rates of traffic fatalities and injury per capita among all age groups. In a MADD 2010 study, 19 appears to be a particularly vulnerable age, as 19 year olds constitute the most seriously injured age group. Motor vehicle crashes, including cars, trucks, motorcycles and cyclists, are the leading cause of death for 16 to 25 year olds. Alcohol and/or drugs are a factor in a significant number, 55%, of those crashes. Although 16-25 year olds represented less than 14% of the population, this age group constituted almost 33.4% of the traffic deaths in which impairment was a factor. Local news sites carry a story almost every week in Ontario, hundreds each year, recounting an event resulting in fatalities to young adults, often after an evening of partying or having a few drinks with friends. In January 2015, on the way home from Jack's Bar in London, a 23 year old driver was speeding on Perth Road when he lost control of the vehicle and slammed into a tree. The accident caused the death of his friend and passenger, and resulted in serious injuries for another passenger. The novice driver had been drinking according to police, and received multiple charges including dangerous operation of a vehicle causing death, impaired driving causing bodily harm, and a novice driving with blood alcohol concentration (BAC) over zero. Regardless of the specific circumstances surrounding a crash, there are several common factors that contribute to the alarming rate of automobile accidents for young adults and it is not unusual for a young driver to be guilty of all of them simultaneously. The most common factors contributing to fatalities for young drivers in London and elsewhere in Canada are as follows. In Ontario, many attempts have been made to decrease the rate of accidents and fatalities amongst teenagers, short of increasing the minimum age at which one can first obtain a driver's licence. Enhanced driver's education, improvements in highway maintenance and increased penalties for DUI (driving under the influence) have done little to stem the tide of teenage driver accidents and fatalities. Only one program has been highly successful and that is the Graduated Driver's Licensing Program. Under Ontario's graduated system, young drivers begin with a G1 licence and must be accompanied by an experienced driver during their first year of driving before they become eligible to drive on their own with a G2 licence. Under both the G1 and G2 licences, drivers are not allowed to have any alcohol in their system when driving. There are also restrictions on the number of passengers in the vehicle. Young drivers must wait another year before they can apply for their unrestricted G licence. Outside the control of young drivers, is the fact that they do not yet have the experience, as drivers, that will allow them to respond effectively and safely during unexpected driving events, and also to focus on important driving cues without distraction. Inexperience alone increases the risk of accidents for novice drivers. There is also a concern that some teenagers do not possess the maturity and judgement to operate a motor vehicle safely. Nor do many have the common sense to stay away from recreational drugs. Combine the two and you have a combination that may lead to death and heartache for the driver, parents, passengers and anyone else involved in a collision resulting from impaired driving. Drug and alcohol abuse and the temptation to drive while under the influence are not uncommon weaknesses for many high school and college students. However, through driving restrictions and education programs, Ontario has been making some headway in terms of saving young adults from making a mistake that can permanently alter their lives and that of innocent accident victims. If you or a family member have been injured as a result of an impaired driving accident or any other type of accident, you need a lawyer you can trust to guide you through the process of recovery. By choosing the London Personal Injury Lawyers of Ontario (ILO) law group, you can be confident that you have a team of experienced injury lawyers behind you. 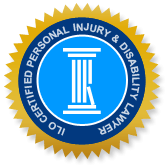 All ILO member firms have practices that are dedicated to personal injury and disability law. Use the form on our website or contact us by phone to learn how we can help.